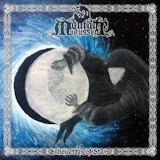 A few years ago, after listening to Australian one-man show Midnight Odyssey's last LP, I reluctantly gave it a "try before buy" rating, despite my liking of the sound, since two hours of undifferentiated cold and calm was too much even for my patience with keyboard-driven black metal. But Shards of Silver Fade was the product of an evolutionary process, and nowhere is the evolution of that music more clear than on their new collection of previously unreleased tracks, Silhouettes of Stars, which is much more to my taste. If these, as Dis Pater claims, are the scraps left over from his album creation process, there is clearly more to Midnight Odyssey's sound than meets the ear in a listen to Shards of Silver Fade. These tracks are just as cold and synth-filled as the last batch, regardless of what era of the band's life they came from, but due to their history, they're a lot more varied in their styles. Buzzing, heavily processed guitars a la Burzum combine with New Wave synth in a mixture as cold and beautiful as a white marble statue on a winter's night on the modern side, where the collection includes the recent single The Night Has Come for Me and Magica. Older, heavier -- and blacker -- pieces such as Fighting the Seraphim are worthy of note as well, however, where the synth has just as much epic grandiosity, and so is The World Tree Burns to Vapour, a sighing synth-duel with the guitars, which are darker and more menacing than they have been in recent years. Dis Pater's calm, even delivery in clean vocals smoothly alternate with the croaking rasp of his black metal vocals, where even the harshest sounds are buried under an anesthetic haze of blurry, layered synths. Some projects have a gift for making an aspect of music that fits poorly on other bands into the most desirable part of their sound. Midnight Odyssey has been said to get better the longer and more drawn-out the songs get, but it's clear from Silhouettes of Stars that Dis Pater finally overdid it on Shards of Silver Fade, and reins this in properly on this collection. Even the newer songs aren't the twenty-minute behemoths of 2015, but not one track suffers from a shorter length. If Dis Pater hadn't been able to resist the temptation to "fix" older songs to sound the way Midnight Odyssey does now, he could easily have ruined some of these gems, but he didn't. Delicate pieces like Themes of Forest and Firmament, a track probably from his demo days based on the name, are thus allowed to relieve the synth-heavy sound and relentlessly swinging beat of A Whisper's Emptiness. A curated collection of past work rather than an ambitious LP, Silhouettes of Stars nonetheless holds its own amongst Midnight Odyssey's regular full-lengths. It's just as cosmic and lovely as past efforts, and at two disks and over two hours, it's about as long as the last full-length. But with a greater variety of songs, it is also more interesting and accessible to casual ABM listeners than its predecessor. For Midnight Odyssey fans, it is a no-brainer to pick up.